Entrepreneurs are a niche of business owners that thrive in creativity and require massive freedom in their business ownership. How would you like to master the art of coaching this dynamic group of individuals? 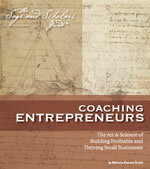 Understanding the different types of entrepreneurs and how they can make or break your practice. The million dollar strategy that makes the difference between a $50k per year job and a $1M + business model.